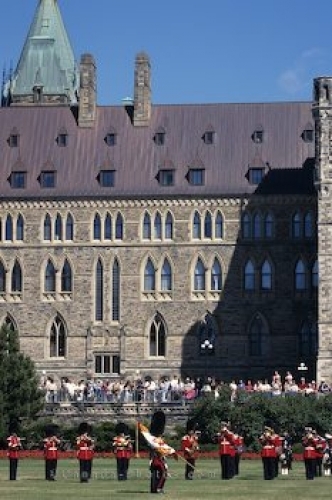 The Changing of the Guard Ceremony takes place in the summer months on Parliament Hill in Ottawa, Ontario. A daily event that happens in the months of June, July and August atop Parliament Hill in Ottawa, Ontario in Canada is the ceremony of the Changing of the Guard. Tourists flock to this event to see this colorful and traditional event performed by the military of the Canadian Forces. Picture of the Changing of the Guard Ceremony in Ottawa, Ontario.